Installation of fixed anchors implies a strong responsibility which you should only take if you have suitable experience. The information given here is not to be taken as the be all and end all of bolting facts. This is advice only and the author is not responsible for inaccuracies, mistakes or accidents caused by using this information. Never assume that the person selling the product (or other climbers including me) are giving the right advice. Read the product manuals and contact the manufacturer if there are any doubts. Before placing bolts in a cliff you must practice at home. Find a piece of stone, a boulder or use your garages cement foundation as a test block. Practice drilling, notching, placing and removing an example of all these types of bolts before deciding on a system. Remember - do not trust the guys in the bolt shops to tell you the right information. They have no idea about dynamic loads related to climbing and will recommend equipment that is not suitable. This guide will steer you towards brands that people have been using successfully for years in Australia - it is then up to you to read the technical manuals for the product and follow the instructions exactly. Contact Neil Monteith if you need any more info. In Australia, routes that contain natural protection are left as such. Bolted cracks are extremely rare and are very much frowned upon. If you can place gear than leave the climb in its natural state. You may not be able to climb the line placing gear but other future climbers certainly will. Leave trad challenges for the future. Keep in mind that climbing gear is designed for climbing, not for window washing or rap-bolting and rap-scrubbing. Fatalities have been caused by a rhythmic brushing motion abrading ropes (pad the edge!). Wear a helmet - rocks fly right and left on virgin routes. Abseil down route and remove loose rock with hammer and crowbar. Bring a rack of natural gear to keep yourself close to the wall. If the route is overhung use natural placements, including skyhooks, to aid down the route. You also might want to buy some removable bolts. If local ethics allow reinforce loose, important holds with glue. An adjustable daisy chain with a hook on it is a very useful tool. If possible, top-rope the route to find good clipping stances and holds. Routes are almost always bolted better if you climb it first. Mark approximate location of bolts with an arc of chalk making sure the clip is possible for short people. The first ten metres is the most dangerous area. If the first bolt is 3m up, and the second is 4.5m up, most people will hit the deck if they fall clipping the second bolt. Solution? Put the first bolt a bit higher and people will either climb up to it a bit more cautiously (people rarely fall off death routes) or stick clip it. Decide whether the route requires a lower off. If the end has a loose or vegetated top-out, a bad walk down or the climb is very steep then a lower-off is recommended. If the crag already has routes with lower-offs then it is a good idea to continue the trend. Make sure the lower-of is replaceable when parts begin to wear. Choose bolt type depending on route angle, difficulty and rock type (see bolt type guide). Work downwards using a Gri-Gri and two daisy chains (adjustable daisies are the best) for holding your body in when using sky-hooks and natural gear. A person holding the end of rope on the ground can be very useful to swing the bolter into the rock on overhangs. Learning to aid is handy when bolting steep routes. Tap rock with hammer to find solid rock for bolt placement. Place the bolt at least 300mm from any fault line (i.e. crack in rock or edge). 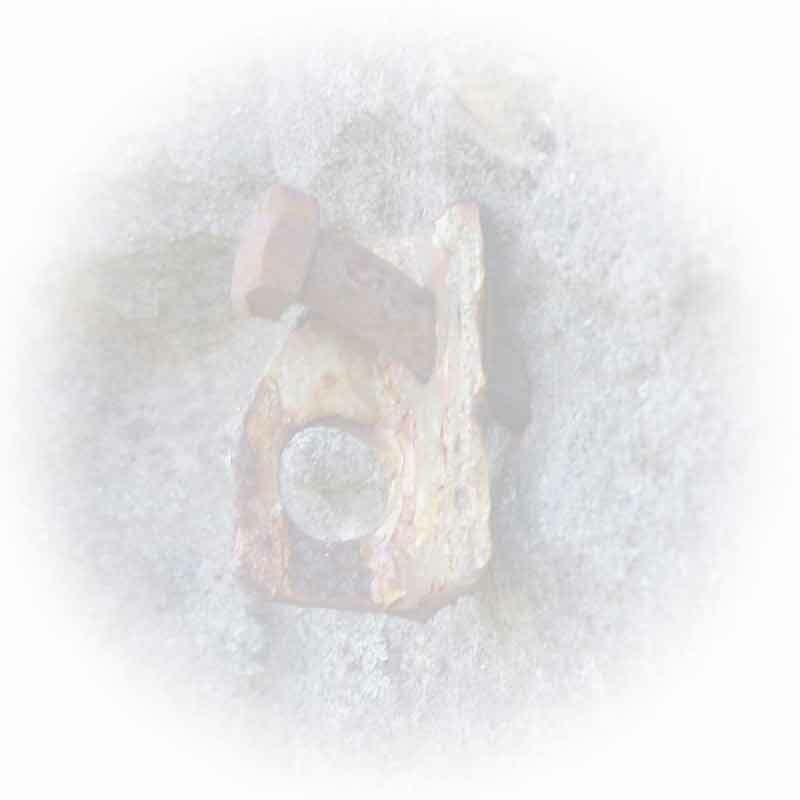 Before drilling hole, hold a quickdraw against the rock to test if proposed bolt placement will force carabiner over sharp edge or open the gate of the carabiner. Use tape on the drill bit to indicate the depth required for the bolt. If placing expansion bolts, be sure to drill 15mm deeper than required so that the bolts can be easily recessed and patched down the track when your classic is rebolted with glue-ins. Start drilling slowly paying attention to create a straight hole which is perpendicular to the rock surface. Take care not to fracture the edges around the hole (drill slowly to start). Once hole is running straight increase drill speed to maximum. For ringbolts you must drill a notch to recess the ring. Drill a 20mm deep hole below and parallel with the first hole. Now drill vertically up and down to remove the rock between the two holes. Test the bolt in the notch to make sure it fits properly. Blow out the dust with a long tube, bike pump or specific blower (these are best). Use a plastic hole brush (test tube brush) to scrub out the excess dust. Keep blowing and brushing until the hole is spotless. This takes time! Clean up any dust that has spread over the cliff during drilling. These big white stains can be visible for miles and will not wash away under roofs. Most expansion bolts require hammering in. Be careful aligning the bolt with the hole. If you end up smashing the bolt hard with full blows of the hammer then something is wrong. Extract the bolt and re-drill the hole before it becomes mangled. You should fix mistakes (empty holes) with an epoxy putty such as Selly's Knead-It which applies like Blu-Tac and hardens like rock. Camoflague it with appropriately coloured dirt or sand. Similar products can be found in any hardware store. Buy some and be prepared. Use a torque wrench to work out the correct amount of tightening. If you cant bring the torque wrench to the crag then practice at home on similar rock to find out what sort of pressure to use. If you tighten too hard you can break the head off the bolt  or more dangerously tighten to a point just before failure. 12mm Ramset Dynabolts require twice as much torque as the 10mm variety so make sure you read the exact brand specifications. If the hole is too short and the bolt does not sit flush then remove it and re-drill. An easy way to remove sleeve bolts is using needle-nose pliers which can grip the sleeve and extract it after the bolt is removed. To remove the loose cone at the base of the hole screw the bolt in without the sleeve and pull it out. Test the bolt by clipping it into a chain of quickdraws and jumping up and down on it. Flick the weight side to side to see if the hanger will slip. On routes with a potential left to right fall the bolt will eventually unscrew itself. It will be plainly obvious when this begins to start occurring. Consider a glue-in ringbolt or U-bolt in this case. Check to make sure the bolt you are going to place sits flush with the back of the hole before gluing. If the bolt will have no fixed hanger then make sure a removable bolt hanger can be placed easily over the head. Place capsule in hole. If the route is overhung than use a little blue-tac on the end of the capsule to keep it in place. Hilti HVU Capsules will hold them selves in without assistance. Place bolt into hex head socket on end of drill. Make sure drill is in hammer mode and drill the bolt slowly through the capsule  breaking it up and mixing it around the shaft. Wipe away any excess glue with a cotton rag. Leave the bolt for the prescribed curing period (usually overnight to be safe). PUT A NOTICE ON THE FIRST BOLT in high traffic areas. Test the bolt before use by loading shear (down) and tension (out) with a quickdraw chain or daisy chain whilst on toprope. Test to see if a hanger will fit over the bolt head. Often the glue-in bolts you have purchased will have machine oil on them from the manufacturing process. They need to be clean for the glue to bond to them, so wash them in hot water and detergent before going bolting. No matter how you do it this will be a messy business. Wear old clothes, use old ropes and bring a spoodge bag to deposit excess glue and nozzles. Clear gear from underneath the climb so falling glue does not stick together your climbing rack! Wear rubber gloves to protect your hands from the glue. A face mask is recommended for extended periods of gluing. You should choose the best glue you can. Epoxy based glues are twice as strong as polyester based glues and are therefore recommended. Epoxy also lasts longer. Polyester glues have been found to degrade over time turning to powder and eventually allowing the bolt to be pulled out by hand. This has happened in the Blue Mountains, Queensland, and in Thailand. A very good glue we can recommend is Hilti RE-500. The most extreme and corrosive environment in the world for bolts is Thailand, and this is the glue that has been tested and approved here. Clean all the holes before starting to glue. This is where some people screw up. The holes for glue-ins must be absolutely spotless. It will take about two minutes to clean each hole. Remember, if there is any dust in the hole, the glue will not bond to the rock in that spot. Do it right! The glue in the nozzle will dry quickly and you will only have a few minutes between uses (with polyester glue, significantly longer with epoxy) before it will be too hard to use. Squeeze two trigger fulls of glue into a ziplock bag before starting. The bag can be checked later to see if the glue cured properly. Check visually that two separate colours of glue (components) are going into the nozzle. Work out beforehand how many trigger pulls of glue is required for each bolt (usually 1-2). Apply this amount to hole starting at deepest point and slowly pulling out to fill hole with minimal air pockets. Wipe excess glue off the end of the nozzle and smear the entire shaft of the bolt with this glue. This will help the glue in the hole bond with the bolt shaft. Insert the bolt slowly with a spinning motion. A few turns should remove any air pockets that have built up. Push hard against the back of the hole. Enough glue should flow out from around the bolt that you will need to clean it up with a cotton rag. Make sure the notch on the ringbolt hole is completely filled. Wipe away all ugly excess glue and smooth down the glue around the hole for a nice finish. When placing a ringbolt under roof you will need to hold the ring in position whilst drying. Wedge a little piece of stick into the entrance of the hole between the bolt and rock. This should keep the bolt from creeping from the hole. A U-bolt is much better as its two legs generally press against the sides of their holes and will keep it in place while the glue dries. Test the bolt before use by loading shear (down) and tension (out) with a quickdraw chain or daisy chain whilst on toprope. Jab the glue around the hole to ensure it's rock solid.